In 1978, Bro. Ustin Lapitan, a successful civil foreman working in the government’s Department of Public Works and Highways, suffered many illnesses. Because of the nature of his work, he lived indulging in many vices like alcohol and cigarettes. It was due to these vices that he acquired many diseases from which he suffered much. One is stomach ulcer, that even if he took many medicines, couldn’t be completely cured. He suffered chronic pain and he was in and out of the hospital. One day, while he and his wife were aboard his wife’s company vehicle, a man flagged them down. They stopped and the man requested if they can bring him to where he lives (apparently, he didn’t have money for transportation). During the ride to the man’s home, it turned out that the man was an evangelist and he didn’t waste time to share the Gospel to Bro. Ustin and his wife. When they reached the evangelist’s house, Bro. Ustin and his wife had been converted. They accepted Jesus Christ as their Lord and Savior and were baptized in His name. They eagerly embraced their new Church, JESUS MIRACLE CRUSADE MINISTRY (or THE JESUS CHURCH), where the evangelist was the Pastor – beloved evangelist Pastor Wilde E. Almeda. Bro. Ustin was prayed for and he immediately received complete healing of all his diseases, and his life was changed. He forsook all his vices and began to live a godly life. ( Bro. Ustin testifies that during those days, there were only a few members since it was the Church’s pioneering years, but the moving of the Holy Spirit was so powerful they were always filled by it every time they gathered together). Later on, he became a preacher of the Church. In 1987, despite being used by the Church as preacher and prayer warrior, he desired to work abroad. He asked permission from the beloved pastor and off he went to Saudi Arabia. After a year of working in Saudi, Bro. Ustin became very ill. He was diagnosed with terminal brain cancer. The disease spread rapidly that he became very sick he couldn’t remember who he was and where he came from. The civil engineer of the company he was working for brought him back home to Manila. Bro. Ustin was so sick he couldn’t recognize anyone. 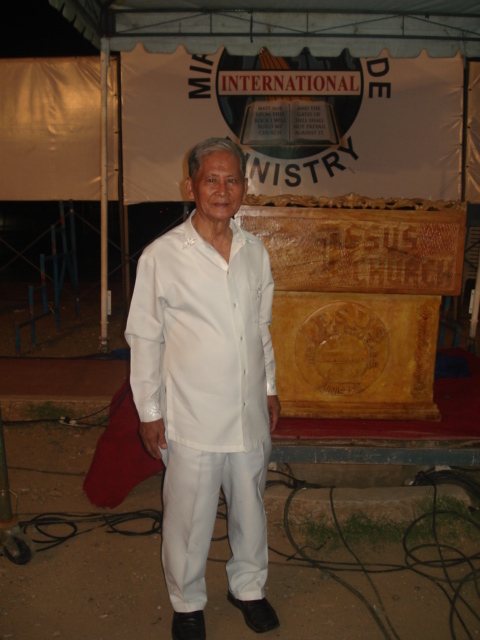 He was brought to the Pastoral House of JMCIM and he was re-baptized. While he was being immersed in water, the workers gathered around praising the Lord. The workers, led by the beloved Pastor, prayed over him. By the great and enduring mercies of the Lord Jesus, he received God’s forgiveness and instant healing. From then on, Bro. Ustin served the Lord faithfully, serving in the ministry as prayer warrior, praying and fasting, and laying hands on the sick.